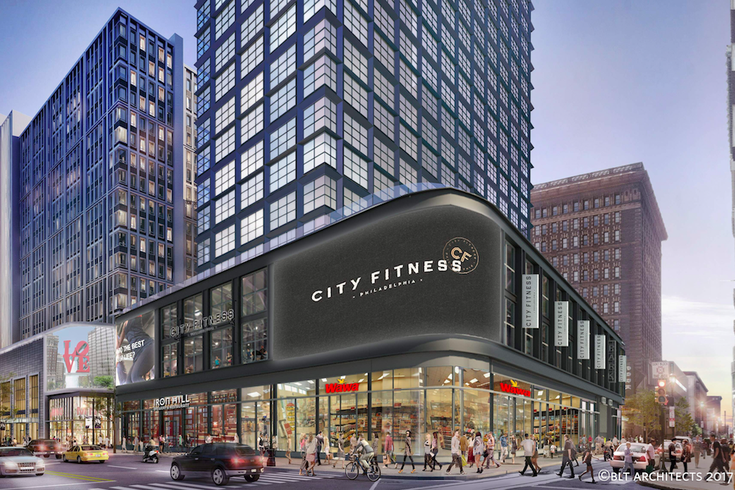 City Fitness, Iron Hill Brewery, Wawa and District Taco are among the tenants announced for National Real Estate Development's East Market project. The second tower in Center City's anticipated East Market project will soon be catering to professionals who seek flexible living arrangements in downtown Philadelphia. National Real Estate Development, the firm behind the ambitious plan to revitalize East Market Street, announced a partnership Monday that will bring 60 extended-stay units to the eventual residential tower at 1199 Ludlow St. The hybrid apartment-hotel offering will be operated by ROOST, a local company that currently provides boutique extended-stay units at locations in Midtown and Rittenhouse. “East Market is a community tailored for how Philadelphians live today,” said Daniel Killinger, managing director at National Development. “With two residential towers, dynamic office space and exciting dining and retail partners coming together within this entire city block, East Market capitalizes on the energy of Midtown Village and a resurgent Chestnut Street to create a neighborhood that appeals to locals and travelers. We are creating a special sense of ‘place’ within Center City and there is no brand that better aligns with this goal than ROOST." The 60 units at East Market will include studio, one- and two-bedroom apartments and penthouses designed for short-term leases. Each of ROOST's apartments will come furnished with contemporary upholstery, custom lighting, antiques and unique artwork, as well as modern appliances and a full-sized kitchen. Amenities will include 24-hour concierge service, on-site housekeeping and maintenance, and an in-apartment artisanal coffee program with La Colombe. “Our guests are often in a period of unique transition, so everything we do is designed to create the ideal environment that helps them feel comfortable and connected to the city,” said Randall Cook, CEO and co-founder of Method Co., which owns and manages ROOST. “We have been looking for a location east of Broad Street for the past few years to meet the demand from that side of town that we have not been able to serve from our other two locations. We’ve also been following the renaissance that is underway in Midtown Village for the past several years, and we felt that East Market was the perfect location for us to put ourselves right in the middle of everything." Cook added that the appeal of the location is bolstered by the East Market Street's growing retail and entertainment profile, with construction underway on Fashion District Philadelphia and plans in the works for an AMC movie theater. Extended stay has become an increasingly appealing trend shaping the US hotel industry, which has seen rising demand for such dwellings in parallel with the emergence of Airbnb. The Highland Group's US Extended Stay Lodging Market 2017 report found about 40,000 extended stay properties in the country, with a record 16 percent increase in construction for this category since 2015. The first of East Market's two residential towers, The Ludlow, at 1101 Ludlow St., features 322 apartments above a ground floor space that will be home to Iron Hill Brewery & Restaurant. Pre-leasing for the apartments began this month. At 20 floors, the second tower will contain 240 apartments and a City Fitness at the corner of 12th and Market streets, along with Wawa and several other area businesses occupying the commercial portion of the building. National Development aims to open the second tower in summer 2018.